At Green Bay, Wisconsin, on the morning of 4 July, 1878, the new tug John Leathem (US No. 76064). which had the engine of the George W. Tifft (US No. 10317), was launched with steam up. She was named after a member of the firm Scofield & Co., to whom the ship belonged to. The John Leathem was 80 feet in length, had a 17 foot beam and a depth of 8.5 feet. Her gross tonnage was 75 tons and net she was at 38 tons. 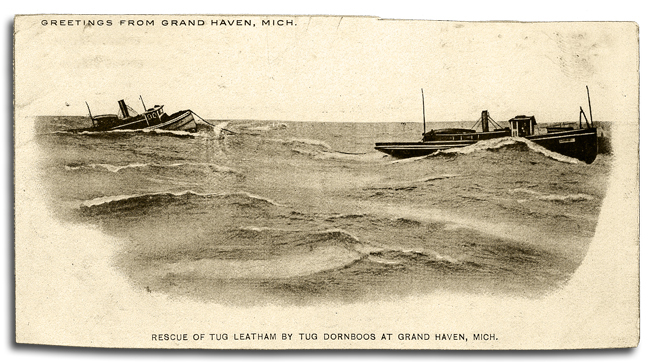 On 31 July 1883 the tug John Leathem lost a raft carrying 200,000 feet of logs. In 1888 new boiler, firebox boiler, 6′ 3″ x 16′, 130 pounds steam, built by National Boiler Works, Chicago. The Manistee Iron Works Company, of Manistee, Mich., has closed two contracts for marine work during December 1891. A 380 HP fore and aft compound engine 14 x 28 x 26 inches, will be built for the tug John Leathem of Sturgeon Bay, Wis., and the engine in the barge Francis Hinton US No. 120754), belonging to Truman & Cooper of Manitowoc, will be compounded. The latter is to be a steeple compound with low pressure cylinder on top. This company’s upright independent air pump and condenser will be placed in both these boats. The engine for the John Leathem was built by Manitstee Iron Works of Manitstee, Michigan. The barge Mike Dohearty (US No. 162498) made her maiden voyage under the tow of the John Leathem on 23 Sept 1899. 1900, Nov Caught fire, Lake Michigan. The tug George Nelson (US No. 85946) had a spurt with the tug John Leathem on 11 June 1902. The crew of the John Leathem then gave the George Nelson a fresh coat of paint on 14 June 1902. She was owned by the Edward Gillen Dock, Dredge & Cons. Co. of Racine, Wisconsin in 1914. She was renamed Holliswood in 1921. The Holliswood was stranded on 10 October 1925 at Bergen Point Lighthouse, New Jersey. 1909, Mar 20 Owned Central Dredge Co., Cleveland, OH. 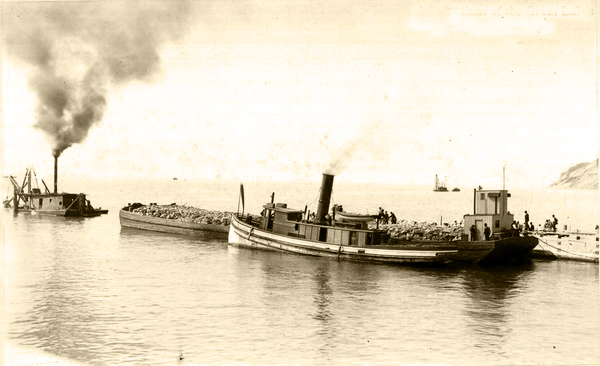 1910, May 14 Edward Gillen Dock, Dredge & Construction Co., Racine, WI. 1918, Feb 28 Owned Hubert Riley, Buffalo, NY. 1918, Dec 19 Owned Harry B. James et al., New York, NY. 1919, Jul 18 Owned William H. Weeks, Jr, New York. 1920, Jul 6 Renamed HOLLISWOOD. 1920 July 21 Owned Tugboat Holliswood Inc., New York, NY. 1925, Jul 1 Owned James H. McKillop, Brooklyn, NY.